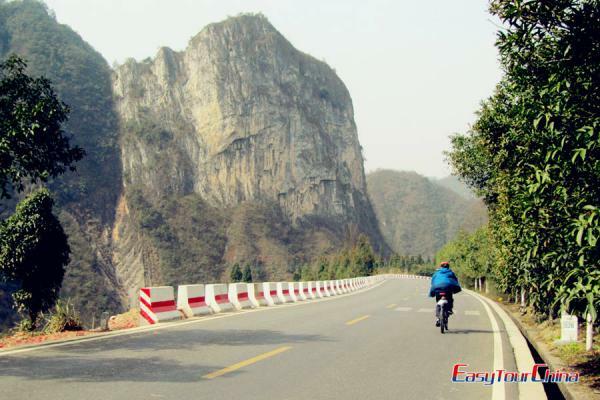 This is an updated route of the old Dragon's trail cycling from Guizhou provice to Guangxi. The 9-day tour starts from mountain areas around Guiyang and the trip is mainly on well-paved provincial road. This program mixes some adventure on countryroads in rual areas of China. Riders will be impressed by the ethenic groups and the unsophisticated culture there, living in hotels and local guesthouses, enjoy traditional food and lifestyle in the minority villages. Exploring the less travelled backroad routes around Guilin and Yangshuo and finish the tour with a highlight bamboo cruise and invigorating mountain bike cycling. Duration: 7 days cycling and 1.5 days hiking. It is very convenient to take the fast train or plane to Guizhou nowadays.The tour starts one day ahead on your arrival in Guilin city. This area of china is the home to different Miao communities; a grouping of linguistically related minorities. As we cycle we pass by wooden houses, often on stilts with animals living beneath them. The Miao wear brightly coloured embroidered clothing and observe strong cultural traditions including a love of storytelling and music. 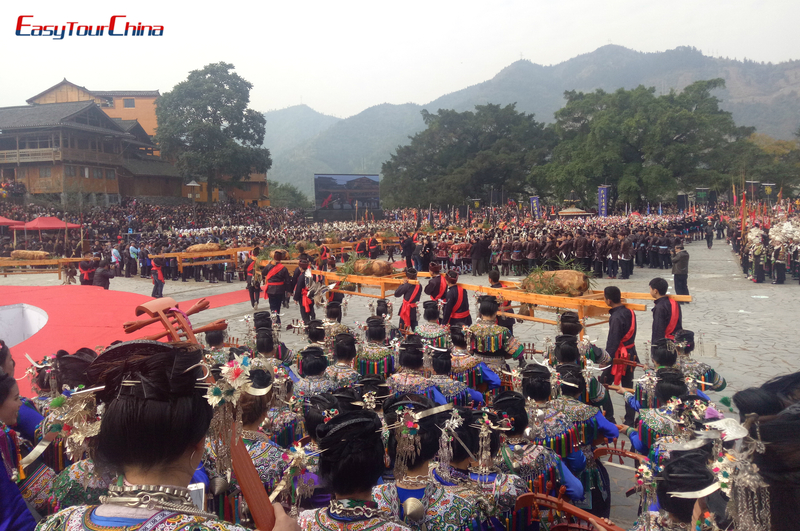 They celebrate many festivals during which there is drumming dancing to the music of a lusheng (a wind instrument). Traditional crafts that you can see being practised include weaving, batik and embroidery. Zhaoxing is famous for its five Drum Towers. According to tradition each individual Drum Tower represents one group of local Dong people. Another feature of the town are the wind and rain bridges amongst the wooden buildings. The Dong people still wear traditional clothing and speak only their native language. The town comes to life early in the morning with a market where you can sample local snacks and observe local life, it is then very quiet during the day when most people are out working in the fields on mountains. The Dong have never had a written language of their own. 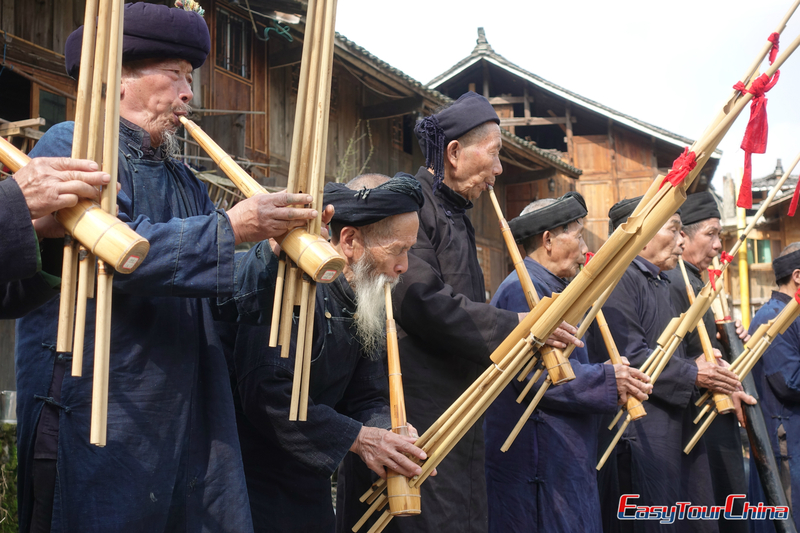 Their history, tradition and philosophy have been passed on from generation to generation in the form of music with choral singing accompanied by unique wooden pipes dances and the never-ending songs. We may be treated to some traditional music while we are here. You can walk up to Tangan, another authentic Dong village via a lovely wind and rain bridge. Tangan is quite high up on the mountain slope and has a very nice "Gluon" and also a Dong museum. This evening is one of the highlights of the trip as we are amongst the first tourists to stay in the village of Basha. We will be surrounded by warm welcome villagers who have very few chance to see foreigners.The village retains its traditional character with wooden buildings, drum towers and farm animals wandering freely along cobbled streets. A late getting up in the morning allows us enjoy the sunlight on the mountain. Soon we will leave this beautiful town and ride downhill from the same road and head to Danian though steep mountains. Danian is another interesting place of Miao people (Guangxi Province)different from the Dong in Guizhou province we have visited. We ride through the boundary from Guizhou to Guangxi today. 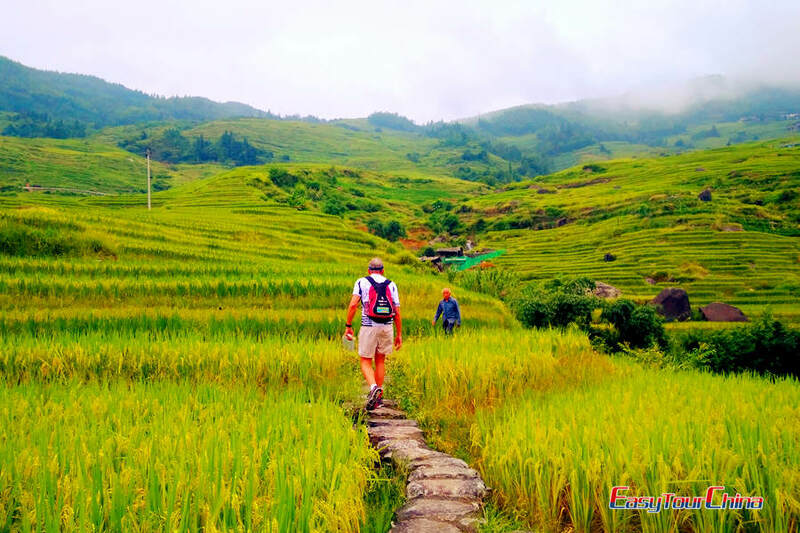 Longsheng county is popular with Longji rice terraces (Longji Titian),known as 'The Dragon's Backbone' by the locals, entire mountainsides have been transformed into rice fields creating a dramatic landscape like great chains, or ribbons extending from the foot to the top of the hills. This maximizes use of the limited arable land and water resources in the mountainous area. There are ten different minorities including Zhuang, Yao, Hui, Miao and Dong. In the village the women still wear unique traditional dress and are famed for having their hair so long that it touches the ground. Many folk festivals take place during the year. The Terraces were first started in the Yuan dynasty and finished in the Qing dynasty by the Zhuang people and look as if they were sculpted into the mountainside. The Longsheng Hot Springs, called "a heaven of peace and happiness" and "paradise on earth," are the centre piece of the national park. You can sample the local specialty rice: cooked with peanuts, beans or other ingredients baked in bamboo tubes on an open fire. You can explore the village on foot and a short climb will take you to two famous vantage points: the' Nine Dragons and Five Tigers', and the 'Seven Stars with the Moon', where you can enjoy breath-taking views. These are considered as the highlights of the 'The Dragon's Backbone'. After a late breakfast and say goodbye to the amazing rice terrace fields, we drive down from the mountain to our cycling start point. Our cycling journey begins from a peaceful village, and then we are facing a big climb for 5KM! Are you ready for this? We will have a adventural cycling today because the route we use is through beautiful valley and river with uncertainties, rewarded with the best view and cycling memories. Today we will finish the first part of Greater Loop of the northern Guilin with a short visit to the old village of Jiangtouzhou. 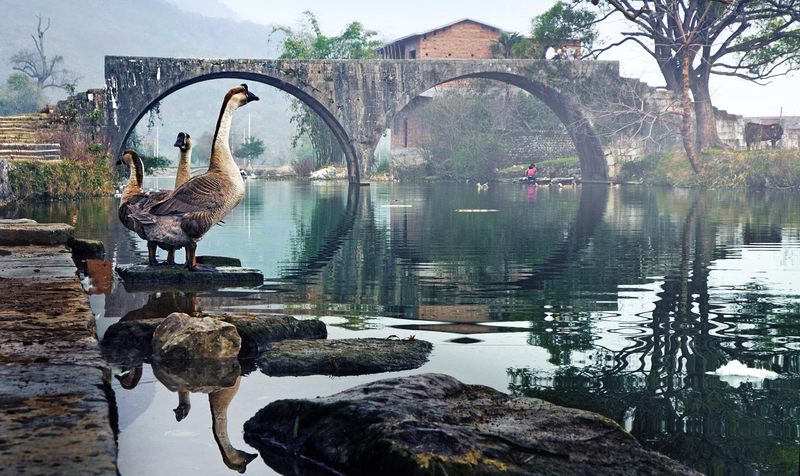 This village is inhabited by a famous philosopher of the Song Dynasty, Zhou Dunyi (1017 – 1073). And their consistent attention to education has produced in history, many good officials. Old houses dating back to Ming and Qing dynasties are all over with intricate wood carvings and stone carvings. Daxu is one of these and is a fine example of what old world China once was, with cobblestone lanes, a 400 year old stonearch bridge and people still living in wooden dwellings roofed inclassic black tiles. We’ll have plenty of time for a wander downthe old streets, view the river side bustle and pop our heads into one of the old courtyard houses to see how the better off once lived. There’s plenty of antiques and curios on offer by the dozens of hawkers along the old main laneway. Along with the obligatory snake oil salesmen, you’ll find sellers offering Mao’sLittle Red Book and other communist paraphernalia, as well aspurveyors of the weird and wonderful herbs and remedies. During our ride through this flatter rural area we stop at several Ming era villages that retain their centuries-old architecture.Near Caoping we stop for lunch before a climb up to take in what the Chinese often refer to as ‘the finest scenery under heaven’ – Karst Mountains over hanging the river. We take a hilly route following the Li, glimpsing these spectacular mountainsabove and below, before a long downhill and flat run into Xingping, an old port village, and our guesthouse with its rooftop views over the river.Xingping is an interesting place to wander around and there are lots of little cafes and handicrafts to check out, adding to its charm. There are some spectacular look outs and swimming spots too.Today the tour takes to enjoy the limestone peaks, crisscrossing rivers, old bridges and ancient routes connecting villages. The difficulty level today is easy but the path crisscross the labyrinth of the small paths. Follow the leader closely. 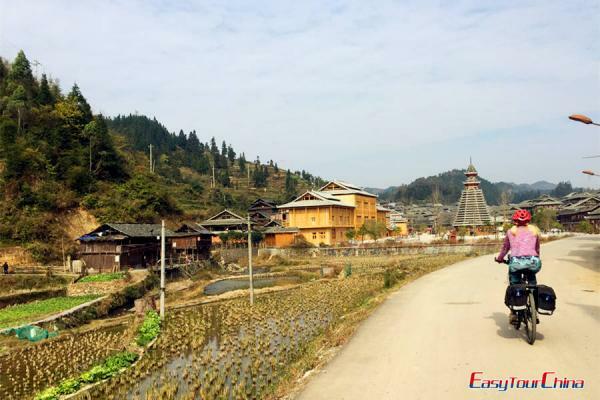 We bike to Fuli ancient town, a peaceful town near Yangshuo, and we shift our route into hidden trails between villages soon, passing over off road bosky mountains, reservoir, and orchard, pools and fields then arrive in Xingping. Plenty of time can be saved today, we will enjoy the scenery of 20yuan printed on CNY, then we can have an optional rafting on Li River or Climb the Laozhai Hill for a panoramic view of big turning of the elegant Li River. 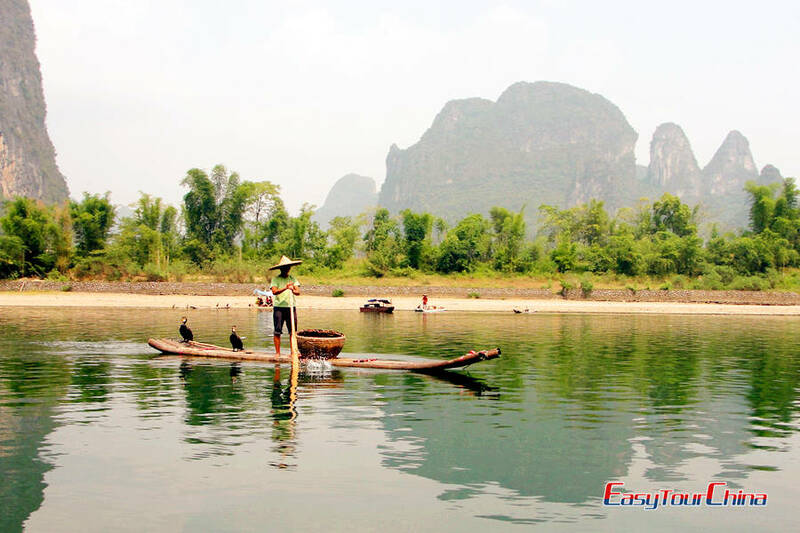 During the journey through big Karst mountain hills today, you will see meandering rivers, limestone hills, rural countryside with rice paddies and mud brick houses. The amazing karst topography and peaceful country road accompany you all the way to Yangshuo. Our trip is quite different from the traditional tours by cars. The biking route today is not so simple, you will encounter macadam, unsurfaced forest-road with soil or even mud. For most of the time we will not have many chances to see groceries and our support vehicle, so do a cautious ride today. There are many elegant places worth to see. So enjoy the time on the road. We will arrive at Yangshuo before evening. Our trip service ends with the breakfast today. If you want a transfer service, please book before hand with us. 7. Any personally expenses and entry ticket price not mentioned in the itinerary.